Allegro MicroSystems: The new A1366 from Allegro MicroSystems Europe is a factory-programmable linear Hall-effect current sensor IC designed to achieve high accuracy and resolution by the use of advanced temperature compensation technology. The proprietary linearly interpolated temperature compensation technology, programmed at the Allegro factory, provides sensitivity and offset that are virtually flat across the full operating temperature range. Temperature compensation is carried out in the digital domain using integrated EEPROM technology without sacrificing the analogue signal path bandwidth. The A1366 is a ratiometric Hall-effect sensor IC which provides a voltage output that is proportional to the applied magnetic field. The factory programming of the sensitivity and quiescent (zero field) output voltage gives a typical accuracy of less than ±1% over the full operating temperature range. The sensor IC incorporates a highly sensitive Hall element with a BiCMOS interface integrated circuit that employs a low-noise small-signal high-gain amplifier as well as a low-impedance output stage, along with a proprietary high-bandwidth dynamic offset cancellation technique. These advances in Hall-effect technology provide an industry-leading sensing resolution at the full 120 kHz bandwidth. The device’s high-frequency operation makes it ideal for use in hybrid electric vehicle inverters, DC-to-DC converters, and electric power steering applications, but the A1366 is equally suited to any current sensing system requiring high bandwidth operation. Broken ground wire detection is also built into the device for high reliability in automotive applications. The A1366 is AEC Q-100 automotive qualified. Device parameters are specified across an extended ambient temperature range from -40°C to +150°C. 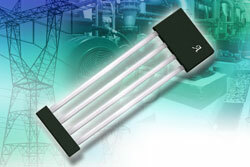 The A1366 sensor IC is provided in a 4-pin single in-line package (suffix KT) with an extremely thin case (1 mm thick). The device is lead (Pb) free, with 100% matt tin leadframe plating.